Tags help you organize and categorize your LiveChat content. To put it simply, tags are words that identify the topic of a chat or ticket. They not only make it easy to group related content, but are vital to understanding your customers and their problems. Applying the tag filter to your archives shows all content within that tag, grouping cases handled by your team by topic. For example, tags such as #bug or #complaint help identify weak points within your product and work on improvements. You can learn more about segmentation and tag-based reporting from the Data-Driven Support Management ebook. See the instructions below to learn more about creating and using tags. Looking to use tags on the desktop app, make sure it’s the latest version. 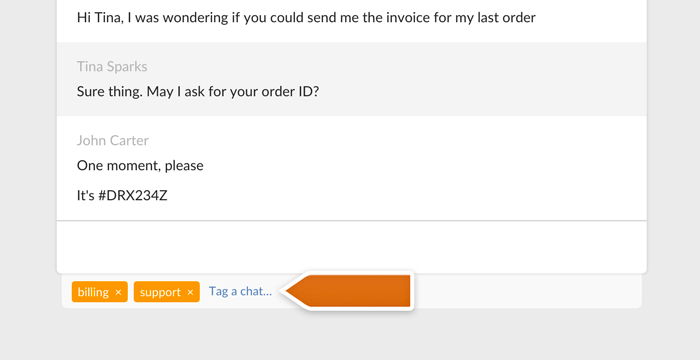 LiveChat Admins can create tags that can be used by all agents for chats and tickets. To create a new tag, log in to LiveChat and go to the Tags section. Once there, type in your new tag in the Tag field. When you are done, save the tag by clicking Add a tag. You can use up to 70 characters when creating a tag. You can also create tags for specific groups. To limit a tag to a selected group, use the pick a group link in the top right corner of the screen. After you select the group, proceed adding the tag normally. To tag a conversation manually, you need to click the add a tag… link just below the chat window and then select the tag from the list. Alternatively, you can type in the first few letters of a tag to find it more quickly or to find tags not visible on the list. To remove an unwanted tag, simply click on the small x next to the tag. In the same vein, you can tag your tickets. Open the ticket you want to tag and click on the Tag a ticket… button. Next, select the tag from the list, just like with chats. You can find the tagged chats and tickets using the tag filtering options. This way, you can easily find all chats or tickets from a particular category, for example, all sales chats. To search your chats by a specific tag, log in to LiveChat and go to the Archives section. Once you are there, click on the Tag filter and select a specific tag from the drop-down list. The same method works for tickets. Access one of the ticket groups, e.g. Open tickets, and use the Tag filter. Additionally, you can filter various reports like Total chats, Chat ratings, New tickets and more. You can use these to get custom reports for specific categories of chats or tickets. Just like in the case of archives or tickets, you need to use the Tag filter and select the desired tag from the drop-down list. You can encourage the use of tags among your agents with automatic reminders. A short message at the end of each chat will remind the agent to tag it appropriately, giving you more information about the cases you handle. To enable the automatic tag reminder, go to the Tags settings and check the Remind agents to tag finished chats option.